7714 Ardaugh Court Dublin, OH. | MLS# 218042218 | Dublin, Powell, and Southwest Delaware County Ohio real estate experts! Find homes For Sale in Dublin, Powell, Upper Arlington, and Worthington. Beautiful Dublinshire brick front colonial on hidden cul-de-sac just down the street from Wyandott Elementary and the North Pool! 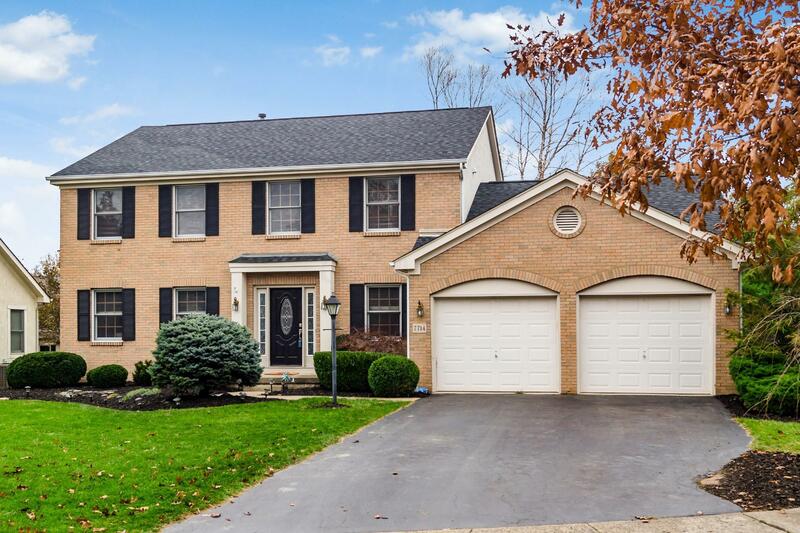 Enter into a spacious foyer with newly refinished hardwood floors leading to a large kitchen w/ granite countertops +stainless steel appliances including a 5 burner gas range & Bosch dishwasher. The kitchen is open to the family room w/ vaulted ceiling, gas fireplace, and sliding glass door leading to the deck and paver patio. Upstairs you'll find 3 additional bedrooms sharing a full bath & the Owner's Suite with spa-like bath & walk-in closet! The full basement includes a professionally finished game room/playroom/living area and ample storage. Coffman, Karrer & Wyandot attendance area and convenient location with easy access to 270/33. Come see!